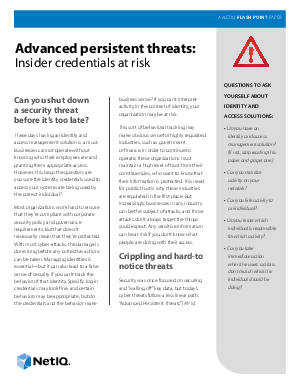 For most organizations these days, the nature of security threats has changed. Perimeter defense is no longer enough. With crippling and hard-to-notice threats that can do damage long before corrective actions can be taken, businesses must know who their employees are, how to grant them appropriate access, and how to identify inappropriate use of that access that may indicate a threat has assumed a privileged user’s identity. This free NetIQ flash point paper discusses advanced persistent threats, the risks they pose, and how automation makes real-time response a reality. It covers questions you should ask yourself about identity and access solutions and the things you should consider before making an investment. Download this flash point paper to learn more.